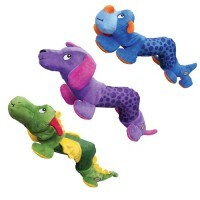 KONG dog toys satisfy your dog’s instinctual needs and encourage them to play. These pet-safe and built-to-chew supplies are made by the renowned company KONG that has been in this business for over 40 years. Made from natural rubber these enrichment items are a perfect treat for your four-legged friends. Browse the entire collection of KONG dog toys from play items, treats and treat dispensers to bedding and grooming products. Choose items that your pooch would love to play at home or on the go. KONG puppy, made from flexible rubber is specially designed for puppies to help them during the period of losing their milk teeth. Useful to massage the gums, this product is available in small, medium and large size. Cool it in the refrigerator, to provide additional relief for sore gums. Can be used until your little pup reaches the age of 9 months. Try the KONG Stuff’N chicken liver flavoured paste with this product and see your little animal experience long hours of play and fun. Your pup will also love the delicious KONG puppy snacks that taste like chicken liver. 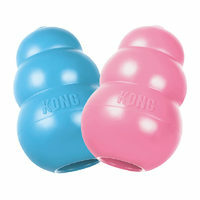 The treats can fit perfectly in the KONG dog toys. The small snacks fit into the small products while the large ones are suitable for medium and large KONG dog toys. The Puppy Frisbee, made from soft rubber, is flexible but robust and perfect to teach your young friend to fetch without causing any damage to their emerging teeth. Teething Stick for your growing pup is made of patented Denta-Ridges to help clean the teeth, promote healthy gums and prevent dental problems. 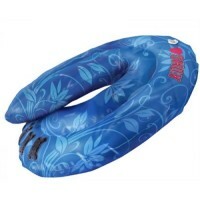 Available in various sizes and in attractive pink and blue. There’s a lot to choose from including teething sticks, activity balls and fun throwing Frisbee to entertain your little friend. Since over three decades KONG dog toys have been entertaining dogs all over the world and the Classic KONG is one such product. Made from bright red rubber, this ultra-durable item is shaped like a snowman, with three balls one on top of another and a hollow middle for stuffing treats. Perfect for the average adult pooch with instinctual chewing needs. Buy this toy and stimulate your loyal buddy for active play. The KONG Extreme is same as the classic KONG but made from black-coloured rubber that is much tougher and designed specifically for the toughest of chewers. This makes it a good choice for larger animals. The toy can withstand powerful jaws without much damage. Fill the hollow center with treats and give your active friend a more enduring challenge. With its incredible bounce, the KONG Extreme is highly recommended for fetch games and interactive play. 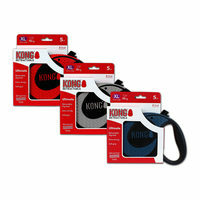 KONG understands that your pets need to play and has made KONG dog toys to stimulate the animal physically and mentally. 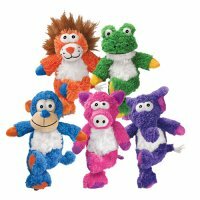 KONG cat toys are designed to enhance your furry friend’s natural instincts to chase, pounce, stalk and tackle. 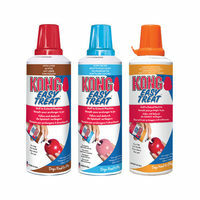 When you shop for KONG dog toys, you can choose items that best suits your pet’s needs. Read the label that displays information regarding the size, age and use such as teething, treats, or interactive play. Age categories include supplies for puppy, senior, classic or extreme for adult animals. Make playtime fun with the bouncy KONG ball made from puncture-resistant rubber. 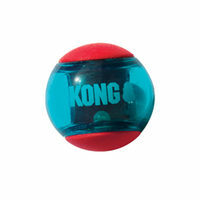 Choose the KONG wobbler, a treat dispensing feeder and play item for high energy pets. Watch your doggy get a mental work-out as he nudges it around to get the food out.